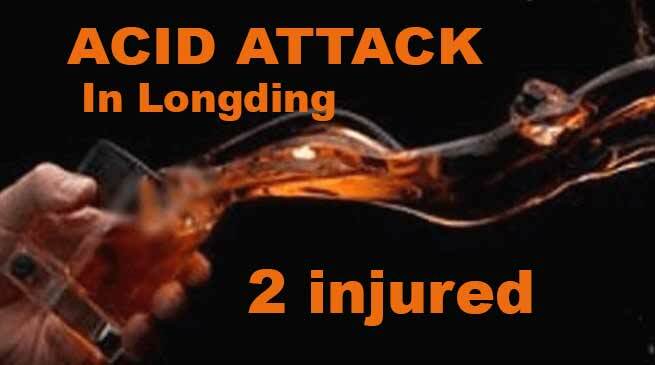 A shopkeeper and his brother attacked with acid in Longding on Sunday. while 5 customer were also received minor injuries . In what could be termed as the most bizarre and shocking incident here, one shopkeeper identified as Anwar Uddin, aged around 35 yrs was attacked with an acid on Sunday evening at around 5: 47 PM. The attack was so severe that his younger brother standing next to him, identified as Akter Uddin aged around 33 yrs also was injured with third degree burn in his leg while 5 other customers had minor injuries which include one police constable. They were immediately taken to the nearby hospital CHC Longding. While five victims have been released after giving first aid, the duo Anwar Uddin and his brother have been evacuated to Dibrugarh, Assam for further treatment. Dr. P Tayeng who attended the case informed that the incident is not life threatening. “However, the attack has damaged the cornea of the left eye of Anwar Uddin, and his brother has got third degree burn in his legs.” He said. The victim who runs a Mobile Store at Longding main market area was attending the customers when suddenly an unidentified man appeared with Jug full of acid and sprayed it at him and disappeared before anyone could make head or tail of the situation. Sh VS Malik, DC Longding and Rohit Meena SP Longding reached the spot and after reviewing all the CCTV footages informed that culprit will be apprehended soon and dealt with iron hand, though the person couldn’t be identified because of the masked face. ‘FIR will be lodged and we will investigate the case on priority.’ Mr Meena said. The reason for the attack is yet to be ascertained. The victim, Anwar Uddin on his way to hospital at Dibrugarh, over phone informed that he has no personal enmity with anyone here. Thangwang Wangham , MLA Longding, condemned the attack of the shopkeeper in the strongest term. The case of acid attack was never heard of at Longding and this heinous crime has jolted the conscience of the whole Longding. The incident has left a big question mark in the mind of every one as to how the acid was procured which is not easily available in the market.